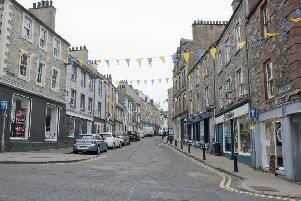 The 91-year-old woman hit by a car in Hawick the week before last has died in hospital. Police confirmed that Christina Morrison, who was known as Ena, was struck by a Volvo S40 as she crossed the road in North Bridge Street around 11.40am on Thursday, January 17. Ena Morrison of Hawick, who died this week from her injuries. Ena, who lived in the town, was taken to Borders General Hospital where she passed away as a result of her injuries on Monday, January 28. Sergeant Neil Inglis of the Borders road policing unit, said witnesses to the incident are atill being sought. He told us: “Our thoughts are with Ena’s family and community at this sad time. Anyone with information can call Police Scotland on 101 and quote incident number 1385 of January 17.